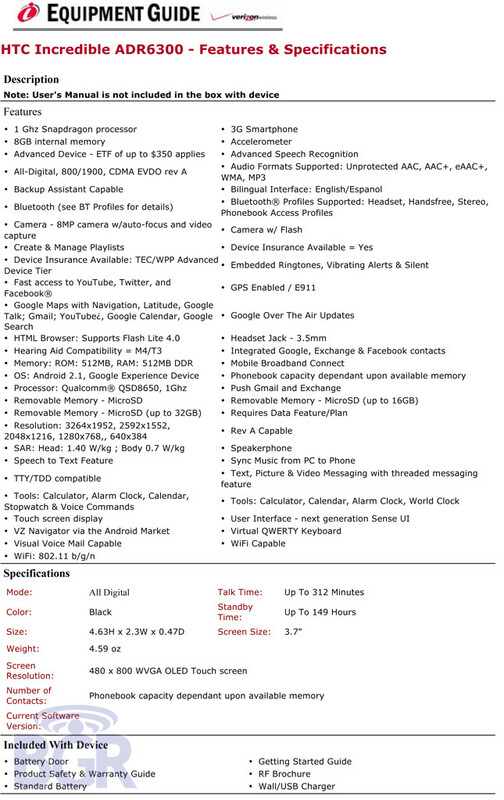 We know how much Verizon users want to know all the latest info on hot Android smartphones with killer specs that will become available on their network, so we're glad to show you this - a pretty detailed specs sheet for the Android 2.1-powered HTC Incredible. To tell you the truth, nothing on it really surprises us, as we have already witnessed the smartphone's full user guide leak, and we know it should have some very, very impressive features like 3.7" AMOLED screen, 8MP camera and 1GHz Snapdragon chipset (though it was rumored to be underclocked) that will make it one quite powerful handset. Anyways, it's always good to see another confirmation, when things are still in the unofficial state. anyone know what the video resolution is? That's the screen resolution... I'm sure the question was referring to the video capture (camcorder) resolution. I'm curious as well, and would be disappointed if it's anything less than 720p. Any chance of UK release? To be honest... (and I love HTC - I currently have a HERO - and it's brilliant) - this is still not enough of a change for me... the Samsung Galaxy i9000 S looks a better bet... HD video recording, etc. The Galaxy S specs are SICK, but the UI is horrendous. If you could root that and put Sense UI on it, or hell, even if you could disable the Samsung UI and run stock Android, it would be an amazing phone. sure the galaxy s is better in specs but its not going to be out for a couple months, has Samsungs unknown UI instead of the well acclaimed Sense UI, and may have network reliability issues, at least for the US it will. The hinge on my LG Chocolate broke yesterday, I (almost) literally can't wait for this phone to come out. I second this..... Also where it lists quick access to youtube and such, the youtube has an upside down question mark at the end of it. Actually this is legit. I just went to a store here in my area after seeing this post because I figured I'd pay my bill cause it was right next to my grocery store. I showed him this post and the sales guy showed it to me. Definetly typos galore. He said they always make typos, he showed me how even though I bought my mifi card my term fee is only $175 not $350 like there equipment guide says. I just bought that a week ago. So I'm not surprised it's wrong. No wonder reps give out wrong info all the time. It's cause they are given wrong info. Wonder if it will have multitouch performance... Anybody? yes it will. it runs sense 2.1 and that actually uses multi touch more than the regular OS. with it, you can pinch in at the main screen to see all 5 screens at once. This looks to be a doctored spec sheet based on an earlier "leak" that was proven false. Seriously Phone Arena, don't you guys use fact-checkers? Just because BGR & Co post something, doesn't mean it's "truth." On a different note ... if those tend to be correct guesses at the spec sheet ... I'll be taking a half-day off work to make the 6am lines. I know a couple people who just played with one, one of whom is a VZW manager who just had training on it this morning. 8 GB internal memory (1 GB dedicated to apps and 7 for media) is correct but there will also be an SD card for additional memory ...i'm told up to 32 GB. And the rumor of the processor being underclocked is supposedly NOT true as it will be a 1GHZ processor. A number managers for VZW have already gotten to see this device. I can't wait! Fake....keep trying....YOU WILL ONLY EVER GET A LAGIT EQUIPMENT GUIDE POSTING WHEN IT ALSO SHOWS A PHOTO OF THE PHONE OTHERWISE ITS FAKE. besides vz navigator via android market? Wifi b/g/n try b/g but no N. Its fake. No mention of an FM radio...Where did people get that from?